The bronze statue of President Jackson seen here is the work of Belle Kinney Scholtz and Leopold F. Scholz. Today you can find it in the U.S. Capitol Rotunda. It’s placed in a very particular spot for a very particular reason. Read my latest post over at American Presidents to find out why. It cannot be emphasized enough that Native American people were subjected to horrific treatment upon the arrival of European explorers and conquistadors in the 1500s. The Spanish instituted the encomienda system where conquistadors controlled large sections of the land and took on the roles of feudal lords. Natives were forced to work the land or in the mines. While we have primary sources detailing massacres, instances of natives being worked to death, and other atrocities the number one killer of natives during the exploration and early colonization period was disease. It is the number one cause of the severe population decrease of natives during those years. And just when we thought it was over it would seem there are new conquistadors in the guise of reality television producers. If I didn’t already have a good reason not to watch their crap, I have one now. I often encourage students to conduct further historical research during Language Arts. I allow students to research things they would like to know more about. This knowledge not only sharpens research and writing skills, but we extend Social Student content to topics I might not ever reach in the classroom. Of course, I do teach a full blown unit every year on formal research and writing where we develop a topic, research, take notes, and then develop those notes into a three to four page report with a reference list to boot. For this unit I have always used U.S. Presidents for our topic became I’m very familiar with the books and I’m pretty knowledgeable about each administration. I make several databases available to students for their research including this one that uses a pull down menu to access voting information for each election. The site not only lists the winners but lists all of those than ran. Sometimes I use this database as a center-type activity for students to research and answer a question or make an observation. One question I’ve used is to ask students to look at the information for the 1800 election and compare the information to the 1804 election. Students should see for the first time in 1804 a separate race was established for the office of Vice-President due to the passage of the Twelth Amendment. Up to that time the second runner-up automatically assumed the office of Vice President. Another observation I’ve asked students to make in the past involved strange or unusual names of men who have run for the two highest offices in our nation by choosing 10 elections and reviewing the names listed. I remind students that the names should not be those that we hear every day. and one of my favorite unusual names even though he resigned in disgrace was Spiro Agnew who ran for VP in 1968 and 1972 winning both times. Which name do you think sounds the most unusual? The image with this post is from the 1880 Republican National Convention in Chicago courtesy of the Library of Congress. The U.S. Constitution outlines three branches of government….the Executive, the Legislative, and the Judicial. Checks and balances are employed to make sure no one branch has total and complete power. What are your thoughts on how our three branches makes America a great nation? Note: The three branches shown in the photo were created by my daughter for a project she is working on for her AP Government class. It’s amazing what some twigs from the yard, an old silk flower arrangement, and a printer can create. You can view other wordless images here. The general public usually does not know what goes into the implementation of a home run winning lesson plan. It takes knowing your subject matter inside and out (a feat within itself), it takes knowing many various teaching strategies in order to link the right strategies with the content, and it takes an inate knowledge of the education needs for each and every student in your group. Finally, it takes knowing something about assessment strategies so that real data can be obtained to measure student progress. However, none of my actions to plan appropriate lessons matter if my students are asleep. It can be very frustrating to be fully engrossed in teaching your plan, look out across the room, and see two or three nodding off. Yes, I’ve had my share of sleepy ones as well. My first reaction has been one of anger. How dare they fall asleep during my lesson?! Next I decided that perhaps it was me. Was I really that boring? I poured over my plans and looked for weak areas. Did I include enough activity for students in my plans or were they merely sitting in their seats watching me? What was the level of the “boring meter” regarding the content the lesson covered, and how could I eliminate the boring factor? Even with all of my introspection I still had sleepy students. I’ve now come to the conclusion that it isn’t always me. There are outside environmental factors that determine how my students react in the classroom, and while I cannot control these factors I still have to address them in a manner designed to maximize the learning in my classes. *In most homes both parents work and have a set time to be at their jobs. It’s hard to get a family up and ready to go all at the same time and often what happens is some children manage to get their clothes on and fall back to sleep while their parents finish getting ready. There is no breakfast since a large majority of kids eat at school now. Once in the car many kids fall asleep again and often still asleep as they are hustled out of the car at school. They stumble into the building sometimes a good hour to 30 minutes before the school day actually begins. Even after eating a school breakfast many sit 15-20 minutes in the hallway before homeroom begins…..just long enough to nod off again. *Some children, even the nine and ten year olds I have taught serve as caregivers for younger siblings in the afternoon and evenings. There is no time for homework or even fun sometimes because every minute is looking after little ones, preparing a meal, or cleaning the house. *Many children are burdened with schedules that would make you and I cringe. Their afternoons are full of various lessons or practices. Sometimes ball practice of some sort last as late as 9 o’clock for some teams. *More and more families are out and about during the evening. Go into any restaurant at 10 o’clock in my neighborhood and you see several children eating dinner with their parents. *I often use writing assignments during Language Arts to gather more incite into the lives of my students, and what they write is very revealing. They are so honest….sometimes painfully honest. 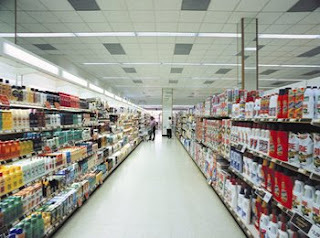 From a simple prompt such as “How I Spent My Afternoon…” I find out that many of my students are visiting the local Walmart at nine, ten, eleven and even after midnite. Some wind up with a parent who is working the late shift. One little boy plays video games every evening till midnight in his Dad’s office and then has an hour long drive home before bedtime. Another student wrote about sitting at the jail with her aunt waiting on the release of her mother. She had been picked up for drugs that morning. *Many children don’t have a bedtime. If they do, it’s much too late. Students report they are up till all hours doing whatever they want to. *Some children report they do have a bedtime, but once their parent goes to bed they get back up to watch the television in their room, play on their computer, read, eat, etc. So I continue to have sleepy babies sitting in my room. One way I have attempted to improve this situation is through the use of lively music and dancing. When things seem to be getting bogged down and I notice a few are getting droopy-eyed we DANCE and DANCE, and DANCE! Yep, we DANCE. We’ll take a break and I play some lively songs and in order to get everyone involved I’ll act as silly as I have to. They think I’m crazy the first few times, but when they see how much fun it can be they join in. No, there are no video tapes of me DANCING….thank the Lord, so don’t ask. Once the break is over we are much more ready to tackle the content at hand and more learning can take place…….and there’s nothing like letting others see you in a silly dance move to build camaraderie among members of a group. And don’t discount Brain Gym for improving the alertness of droopy students. Can you think of some other lively tunes we could use? House number one is a 20 room mansion (not including 8 bathrooms) heated by natural gas. Add on a pool (and a pool house) and a separate guest house, all heated by gas. In one month this residence consumes more energy than the average American household does in a year. The average bill for electricity and natural gas runs over $2400. In natural gas alone, this property consumes more than 20 times the national average for an American home. This house is not situated in a Northern or Midwestern “snow belt” area. It’s in the South. House number two was designed by an architecture professor at a leading national university. This house incorporates every “green” feature current home construction can provide. The house is 4,000 square feet (four bedrooms) and is nestled on a high prarie in the American southwest. A central closet in the house holds geothermal heat-pumps drawing ground water through pipes sunk 300 feet into the ground. The water (usually 67 degrees) heats the house in the winter and cools it in the summer. The system uses no fossil fuels such as oil or natural gas and it consumes one-quarter electricity required for a conventional heating/cooling system. Rainwater from the roof is collected and funneled into a 25,000 gallon underground cistern. The collected water then irrigates the land surrounding the house. Flowers and shrubs native to the area surround the home enabling the property to blend into the rural landscape. Hmmmm….I wonder who lives in these houses? I kept reading and the email soon told me. House number one is outside of Nashville, Tennessee, and it’s the abode of the “environmentalist” Al Gore. Yes, that Al Gore. House number two is located in Crawford, Texas. Today it is known as the Western White House and belongs to President George Bush. Yes, that president! Now to be totally honest about Mr. Gore and his not so green home. He and his staff have stated that the home is much larger than the average American home and of course it will use a larger amount of power. Also the Gores pay an extra premium to make sure their power comes from green sources other than the $2400 big green ones they ante up each month. Mr. Gore has also concluded that his carbon footprint works out in the end because his home is also an office for both he and his wife, Tipper. Who knew Bush was so green!? You can find out more about your own personal carbon footprint here. Well the new outfits have been bought, a menu planned, groceries bought, and arrangements have been made with Sir Bunny to leave a few bits of chocolate for my really-too-old-for-the-bunny-thing children. When does it stop? I mean they are 15 and 22! Who am I kidding! If someone fixed me an Easter basket I’d take it. I’d want lots of chocolate and a few sparkly things too! All that’s left to do is the churchin’, the cookin’, and the eatin’. If you are new to History Is Elementary you might enjoy my Sticky Easter Memory…I never celebrate Easter without remembering the particular Easter detailed in my story. Whether you celebrate Easter or not I send good wishes your way that your weekend is safe, relaxing, and filled with what you desire. I’ll be back Monday with more history goodness. 1. The first college founded in America north of Mexico was founded by French Jesuits in Quebec in 1635. Harvard was the first college founded in the British colonies the following year. 2. The first written constitution in the Americas was the Fundamental Orders, written for the Connecticut Colony at its founding in 1639. This document is considered the first written constitution not only in America, but the world as well. 3. There were two firsts in the category for magazine. Two Philadelphia-based political periodicals, both published in February 1741, share the honor. One was the American Magazine or A Monthly View of the Political State of the British Colonies published by Andrew Bradford. The other was the General Magazine and Historical Chronicle for all the British Plantations published by Benjamin Franklin. They both folded within the first year. 4. The first cookbook published in the United States was from 1796. It was called American Cookery by Amelia Simmons and was published under the pen name An American Orphan. There were four editions of the cookbook between 1796 and 1808. 5. The first U.S. federal prison was established in Auburn, New York in 1821. The Auburn Method used in subsequent prisons began there. Inmates were required to work silently in groups. When they weren’t working inmates were confined to their cells and were required to be silent so as to meditate on their crimes. 6. The first U.S. warship to make it around the world was a sloop named the Vincennes between the years 1829 and 1931. President Andrew Jackson used this action as a show of force to protect American commerce in the Pacific. 7. The first American steam railroad to carry passengers and freight was the Baltimore & Ohio Railroad. It began in 1830 and was powered by the Tom Thumb locomotive built by Peter Cooper. 8. The first U.S. president photographed while in office was James K. Polk in 1849. 9. The first Socialist elected to the U.S. Congress was Wisconsin’s Victor Berger elected in 1911. 10. The first movie to be shown in the White House was D.W. Griffith’s The Birth of a Nation during the administration of Woodrow Wilson. 11. The first person to receive a Social Security check was Ida May Fuller in 1940. The check was for a grand total of $22.54. 12. Walter F. Mondale and Robert Dole took part in the first vice presidential debate in the 1976 presidential election between Gerald Ford and Jimmy Carter. 13. The first atomic powered submarine launched from Groton, Connecticut in 1954. It was named the Nautilus. In case you aren’t sure this is a grocery store aisle. How does this image fit in with my theme? Leave me a comment. You can find other wordless images here. Shame on you… if you don’t use primary sources like journals and letters to teach history. Darren, over at Right on the Left Coast, has begun posting family letters written in 1865. He’ll be posting them over a few days. Go take a look. Darren mentions the spelling errors, but I’m mesmerized by the formality of the writing and tone. Back in January I wrote about the upcoming miniseries about President John Adams. Last night I watched the first two episodes. As I watched I jotted down some things that I found interesting. *As a whole what I’ve seen so far shares great visuals of social mannerisms and dress for the time period. Everyone looks a little unkept and they should. Without hair dryers and permanent press things were much, much different. The tar and feathering scene was hard to watch. We tend to place the Patriots on a pedestal, but they did some very alarming things in their quest to establish their rights. These actions should not be forgotten. *The trial for the soldiers following the Boston Massacre was particularly interesting as the court system we are used to didn't exist. Very few Americans realize Adams represented the British soldiers let alone that the incident was used as propaganda by the Sons of Liberty. *Ok, some details are being left out, but it is a movie afterall…Following Lexington and Concord, Abigail Adams recognizes the body of Dr. Warren in a cart, but that's not the whole story. *The conversations between Adams and his wife, Abigail, were the standout moments of part one and part two. Her importance over the life of John Adams cannot and should not be glossed over in any classroom. It is an interesting point that her counsel was so important yet today we seem to have hissy fit if we think our fearless leaders take counsel from their wives. Hmmm….. One sentence of Abigail’s struck me rather forcefully….”I’m frightened. I’m afraid this war will never end or begin.” Twenty-first century Americans are rather comfortable in our freedom. We tend to forget those that forged the way for us. It was rife with doubt and fears. *The road to making the declaration that the colonies were free was not an easy one and to a certain extent the miniseries shows this. The personal convictions expressed and the zeal with with the pros and cons were weighed were riveting. I couldn’t help but laugh at one point when the delegates are arguing into the night and it’s so very hot in the room mainly because the windows were kept closed so folks wouldn’t overhear them. Adams removes his wig at one point. He gets caught up in the conversation and begins to speak. Then he realizes he doesn’t have his wig on and quickly places it back on his head. *At the moment the vote is taken for independence the stunned silence at what they have done is a highlight not to be missed….and one delegate got it so right when he said Congress had the opportunity to do what no other group of men had done in history up to that time in forming a government where all men would be free. How I wish they had settled the slavery issue at the Constitutional Congress following the Revolution? 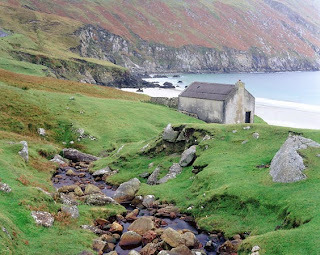 This picture is from Achill Island in Ireland. I thought it was an appropriate Irish scene to go along with St. Patrick’s Day. Don’t we all simply live to get to Friday? Fridays just have a different sort of feeling to them. They are normally that little bend in the racetrack where you can catch your breath for moment, look back on a week accomplished, and begin to plan for the week ahead. Last Friday night I was posting something over at my Georgia site while there was a nice little rain coming down. It was already dark and I was waiting on my husband to get home. News reports had mentioned rain and had mentioned the possibility of wind but no mention of tornados. As I was working with my laptop the lights suddenly went out…..pitchblack except for the light of the laptop which had switched over to battery. I kept working as the power went on and off, on and off, on and off, on and off, several times in succession. The rain had stopped, and it was very quite and still. Five minutes later the storm sirens went off. I didn’t get scared until the sirens went off. I think that sound is more scary than the wind and the rain, quite frankly. It was so confusing to hear the siren because there was nothing going on outside. There I was computer in hand, no warnings from my television, no warnings when I checked the local tv sites…..nothing but quiet. I thought maybe I should go to the basement, but there I was in the dark with no flashlight, and I’d probably kill myself just trying to get down there navigating the maze I’ve created with “important stuff” I keep telling myself I need to store. Come to find out while it was so quiet and the power kept going on and off a tornado was overhead and was traveling to its dismise just a few miles away. In fact the storm had hit a grocery store and some houses about 5 miles away from me and had done quite a bit of damage. Witnesses there said the sirens didn’t go off until ten minutes after the storm had hit. What’s the point? Later in the week the National Weather Service confirmed a touchdown of an EF1 tornado with winds of 110 mph. The track of the storm was seven miles long and approximately 100 yards wide. The touchdown was at Hampton Mill Road, and the track continued northeast through the grocery store across Chapel Hill Road through Brookmont, and finally disappating at Vulcan Drive near Groover Lake in Lithia Springs. Since I’m near Vulcan Drive I know that all of that time it was so quiet the storm was moving overhead. That brings me to last night when the city of Atlanta made history. A tornado hit the city for the first time that we know of. The damage pictures are absolutely amazing. Fellow Georgia blogger Spacey G from Mostly Media shares her own video from last night. Details from Atlanta’s oldest local news channel, WSB-TV, can be found here along with a slideshow of images taken by media types, and a slideshow of images uploaded by everyday folks. A paper from Kentucky has a few daytime images of highrises as well as the many condo buildings (converted factories) that dot the downtown area. It is amazing to see Atlanta landmarks like the Equitable Building and the Peachtree Plaza with windows blown out. Also, as much as many Georgians complain about the craziness that can go on with Atlanta government and politics it seems the city did a great job last night handling a situation that could have resulted in utter chaos. I’m sure we’ll hear somebody complaining in the days to come though. As I am writing this today another wave of storms are racing across the state and fatalities are reported in Polk County, Georgia. For a time they were mentioning my father’s community of Macedonia near Canton, so I have been in prayer for folks I know and love as well as folks I don’t know. Springtime in Georgia….it appears it will be a bumpy ride this year. UPDATE: A little while after I posted this we had another storm come through with hail the size of golf balls. The storm went over us, but as it moved on towards Atlanta a local television tower camera got an image of it. It's rare to get an image of a tornado in Georgia. See my update over at Georgia on My Mind titled Well, Hail! The newest edition of the Georgia Carnival is up for your reading pleasure over at Shelbinator.com. This edition includes great timely topics, interesting categories, and the wit and reparte we have come to expect from the Shelbinator. If you're education minded the education carnival is up over at Learn Me Good while Noirlecroi.com presents a teacher's life carnival. 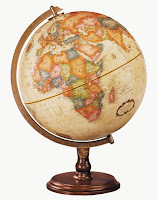 In keeping with the self-imposed Social Studies theme around here I offer up for you 13 or so blog carnivals that focus on one specific geographic area or with travel in general. Now c’mon…..isn’t this just waaaay cool? 12. Travel on a Shoestring-Americas and Travel on a Shoestring-Asia, Oz. So, go take a twirl around this great big world of ours and have yourself a wonderful Thursday! Note: Some of the websites where these carnivals are located are simply host blogs. If you would like to participate in any one of these carnivals check the Blog Carnival site for the blogger that maintains the carnival, current host, and submission requirements. Does great scenery make America a great nation? 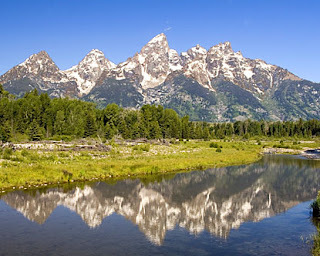 This is a scene of the Rocky Mountains as seen from Wyoming. The American History curriculum that I teach to nine and ten year olds is basically the same course of study students receive in high school. The state assessments include questions that would give most adults a run for their money. Dealing with students who begin the year thinking Robin Hood fought the American Revolution with help from SpongeBob and Gary the Snail and a belief that woodland creatures often broke into song with Pocohontas because "Disney says so" also makes my job daunting since "the test” is how I’m judged regarding my teaching capabilities. That being said it is certainly an understatement to say that I love teaching history. History is one subject where small bits of knowledge can be used to review content as well as extend content in order to meet up with future content. Follow this link to continue reading this post regarding how a painting by Trumbull, the Battle of Bunker Hill, and a pile of rocks contributed to the character of a U.S. president. 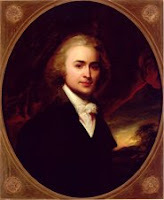 The picture with this post is a young John Quincy Adams by John Singleton Copley. There’s no easy way around it….this post may disturb you. While I have no family stories regarding an ancestor who took part in a lynching or even viewed a lynching it doesn’t mean they didn’t. It doesn’t mean they did either. However, as a Southerner I can’t help but be shocked at what my fellow Southerners did in years past. The act of lynching, mob mentality, the celebratory nature of the events, and the braggadocios behavior that followed have haunted and will continue to haunt the South for many more years to come. Apparently Mr. Lynch’s extralegal sentences---whipping, property seizure, coerced pledges of allegiance, and conscription into the military---were accepted by Virginia lawmakers and “Lynch’s Law”, “Judge Lynch”, and “Lynching” became synonymous for punishment outside the law. Of course when the word “lynching” is used today we automatically reflect on the horrific acts across the South though there have been lynchings in every state of the Union but four. Much like floggings, disembowelments, and the decapitations that took place in merry old England lynchings drew a crowd…..a crowd of some of the most powerful and prominent members of a community. This macabre practice by Southern ancestors gets even stranger when you realize they were proud enough to have their pictures taken with the evidence of their crimes, and even stranger still to realize many of the photographs were reproduced on postcards so they could send them to friends and family members. Sadly, many of these murders were committed against innocent men and women as a result of trumped up charges. Over at Georgia on My Mind I posted about the lynching of Leo Frank, a Jewish man who was lynched by mob in Cobb County, Georgia in 1915. 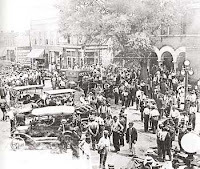 The picture with this post is some of the crowd celebrating the lynching in the town square at Marietta, Georgia. Recently a historical marker was placed at the lynching site and some of Georgia’s famous sons were there to remember and condemn the horrific events of that day including former governor Roy Barnes…..seems one of his great-grandfathers was a participant in the events that day. This site advises Strange Fruit was a controversial song. It was a struggle for Ms. Holiday to incorporate into her nightclub act, but she wanted to include it as her “personal protest” song. May we never forget……How on earth could we? One of the first historical figures I read about as a young child was Helen Keller. Her story is an excellent example to share with children regarding overcoming great difficulties. When I have tried to figure out the right combination of strategies to communicate with an autistic child I’m often encouraged by the courage and determination of Miss Keller’s teacher, Anne Sullivan. 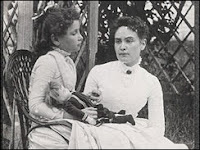 The picture with this post is a brand new one recently found showing Helen Keller and Anne Sullivan. It just may be the earliest picture of the two together. Miss Keller is probably around eight years old. You can read all about it here. As an adult Helen Keller was very involved in politics and social issues. Textbooks covering women’s issues usually mention Helen Keller, but rarely go into much detail because of her radical (some for the time period) ideas. Besides her involvement with Helen Keller International, her non-profit organization for preventing blindness, she also worked as a suffragist, spoke out against war, and supported birth control (a very radical idea for the times). She was one of the founders of the American Civil Liberties Union in the 1920s and was a known radical socialist. As a member of the Socialist Party she campaigned for Eugene V. Debs when he ran for president. I’m glad that in today's classrooms students can access resources that explain the whole story of Helen Keller’s life….not just a cleaned up version that meets someone’s idea regarding what a good American looks like. Helen Keller and other high profile individuals who lived during the early part of the twentieth century are perfect examples for students to analyze the life choices historical figures made along with actual historical events and social issues of the time. When examining a historical figure it is helpful to dig a little deeper to understand why someone makes the particular life choices they make. Putting events and life choices in context with the times being studied help to build critical thinkers, and that should always be the ultimate goal in a study of history not a regurgitation of causes, effects, and dates. While most state standards state students should be familiar with the relationship between European colonists and Native Americans very few students ever really receive an adequate background regarding the interactions between colonists and natives. Perhaps it is because the standards…..and I’m basically referring to Georgia standards……only mention the interaction not specific interactions such as the Pequot War. I wish more teachers would spend a little of time discussing the Pequot War since it is one of the first major interactions between colonists and Native Americans. While it is mentioned in many of today’s textbooks being used in lower middle grade classrooms the war is not generally covered at an adequate level and it is usually grouped with King Phillip’s War which occurred almost thirty years after the Pequot War. 1. The main events surrounding the Pequot War occurred between 1637 and 1638. The parties involved were the Massachusetts Bay and Plymouth colonies along with Native Americans from the Naragansett and Monhegan tribes against the Pequot tribe. The Connecticut colony was also involved. 2. The homeland of the Pequot tribe was along the Thames and Mystic Rivers. Growing European settlement found the Pequot tribe basically surrounded by English and Dutch colonies. They weren’t very happy about it as you can well imagine. 3. Causes of the war stem from the murder of eight Europeans in 1634. John Stone has been described as a privateer, slaver, and smuggler. He and his crew were attacked near the mouth of the Connecticut River by the Western Niantic, a tribe connected to the Pequots. The reason for the attack was earlier Dutch traders had lured a member of the Niantic tribe aboard a Dutch vessel and then held him for ransom. When the Pequot paid the ransom they received a corpse in return. John Stone figures into the picture because he had been committing atrocities as well. He had a habit of kidnapping Western Niantic women and children and selling them into slavery to the Virginia Colony. 4. Even though John Stone had been banished from Boston due to malfeasance colonial officials were extremely upset at the murders and made demands to the Pequot that the Western Ninantic tribe members responsible for the killings should be turned over to them. The Pequot refused. 5. In 1636, another colonists, John Oldham, was attacked near Block Island. He and his entire crew were killed and the ship was looted. Some scholars debate that many of the New England colonists blamed tribe members from the Naragansett, however, John Oldham’s murder and the murder of his crew is touted as a beginning point for the Pequot War. 6. Within a month John Endicott, governor of the Massachusetts Bay Colony, sent a group of men on a revenge mission to Block Island. In the whole scheme of things it was a small fracus with 14 members of the Niantic tribe loosing their lives. The village was burned to the ground and crops that had been stored were either destroyed or taken by the colonists. 7. Endicott then traveled to a Pequot Village where the demand was made again for payment regarding Stone’s murder and Oldham’s murder as well. The demand resulted in many of the Pequot escaping through the woods and the loss of their village and crops to fire. Endicott and the other Massachusetts Bay colonists went home. 8. The Pequots turned their anger on the Connecticut colonist and began a seige on Fort Saybrook. By 1637, the Pequot began attacking colonial towns. Buildings and fields were destroyed, a few colonists were killed, and even two young female colonists were kidnapped, but were eventually returned via Dutch traders. 9. Finally, on May 20, 1637, Connecticut colonists attacked the Pequot at a village known as Misistuck or Mystic. Many of the men of the village were gone having traveled to Hartford on a raiding mission. When the colonists attacked Mystic it was mainly inhabited by Pequot women and children. It was a massacre with the colonial leaders using God as a justification for the killing. Approximately 600-700 natives were at Mystic during the attack. Only seven or so were taken prisoner. Only another seven or so escaped. The remaider died. 10. The actions of the colonists so horrifed members of the Narragansett and Mohegan tribes who were along on the raid that they returned home. That was the end of their participation. The idea of “total war” was foreign to Native Americans. They stated that the warfare waged by the English was too furious and too the number of deaths were too numerous (from William Bradford’s Of Plimoth Plantation, 1620-1647). 11. From that point on the Pequot were hunted down, taken prisoner or killed systematically. 12. On September 21, 1638 the Treaty of Hartford was signed. Pequots who had survived were distributed to the Naragansett, Mohegan, and Metoac tribes as slaves, or shipped by colonist to Bermuda where they were sold into slavery. Some became household slaves belonging to colonists in Massachusetts Bay or Connecticut. Colonists declared the Pequot extinct and took their lands. They even outlawed the word “Pequot”. "The effect of the Pequot War was profound. Overnight the balance of power had shifted from the populous but unorganized natives to the English colonies. Henceforth [until King Philip's War] there was no combination of Indian tribes that could seriously threaten the English. The destruction of the Pequots cleared away the only major obstacle to Puritan expansion. And the thoroughness of that destruction made a deep impression on the other tribes." While many historians still argue over who was at the most at fault and over the number of Native Americans that were actually killed primary sources such as Captain John Mason's account or the account of John Underhill are useful reads. Did you know there were two flags raised on Mt. Suribachi that day? Did you know three of the five flag raisers played themselves in the John Wayne movie Sands of Iwo Jima? Did you know one of the five flag raisers (Ira Hayes) was a Native American? Does this image portray America as a great nation? Why or why not? Somehow this post title doesn’t have the same stirring ring to it as “one if by land, and two if by sea”, but the Old North Church in Boston is changing with the times. This article greeted me this morning as I was preparing to start my day. So, what’s so important about April 18, 1775? On that evening church sexton, Robert Newman, climbed the steeple and held high two lanterns to signal Paul Revere, William Dawes, and the other midnight riders that the British were marching to Lexington and Concord by sea and not by land. What followed is commonly referred to as the 'shot heard round the world'. While the installation has been done with historic sensitivity, and while it is as one visitor remarked no different than updating a building with air conditioning or running water it is a little sad that eventually the steeple’s compact fluorescents will be replaced with LEDs. It might be a little interesting, however, to tie in the concept of historic preservation with the march of time and technology when studying Lexington and Concord. Archiving Early America which has a few slideshows that could be useful to introduce a topic, review a topic, or for small group and individual use. The Georgia Blog Carnival is up over at Georgia on My Mind. It’s the perfect combination of great reads! The Education Carnival was posted this past Wednesday over at the Sam Jackson College Experience and contains lots of education topics. The History Carnival can be found over at Spinning Clio. Marc advises he had several off topic submissions. I’ve noticed the same going on with Education Carnival and the Georgia Carnival as well over the last several months, and the practice seems to be increasing. Did some spammy blog guru post some sort of insane post advising high-roller wannabes to submit to every blog carnival that comes down the pike to increase their hit counts and links? Basically the practice does nothing but slow down the carnival host as they attempt to put the carnival together, frustrate the readers who visit a carnival for one particular overarching topic or focus, and it really does nothing to increase the blogger’s reputation who adheres to submitting to this carnival and that carnival willy- nilly. These folks get a great big BOO from me…..not that it matters to them. Me? I’m an innkeeper this weekend. Go read the intro to the Georgia Carnival and discover why. One thing is for certain....it’s very difficult to keep 8 female guests supplied with enough towels and toilet paper to get them through their day and evening. Last night at bedtime (2 a.m.) two of our toilets flushed continuously for 30 minutes…I kid you not! Also, don’t believe that hogwash regarding how teen boys eat more than girls. This evening they plowed through an entire stock pot full of chili and since last evening I’ve already thrown away six empty 2-liter drink bottles not to mention a gallon-sized milk jug that was full this time last night. Don’t get me wrong….for all my fussing I’ve enjoyed being their host. The whole situation has proven to me though that I don't have what it takes to be a hotel mogul. Have a great rest of the weekend. I have to go on a reconnaissance mission regarding toilet paper and fold more towels.